Which Brand Is Unhealthy For Dogs? Are you concern that you feed your pet with unhealthy food? Do you want to see the top 6 dehydrated dog food brands in 2019? Organic dehydrated dog food is the best one on the internet. I am a dog owner and a dog food judge and in order to provide my pet healthy and completely balanced food, I have made a comparison. Now I want to reveal you my test results. 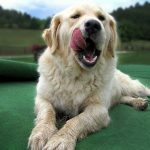 Top 6 dehydrated dog food brands in 2019. 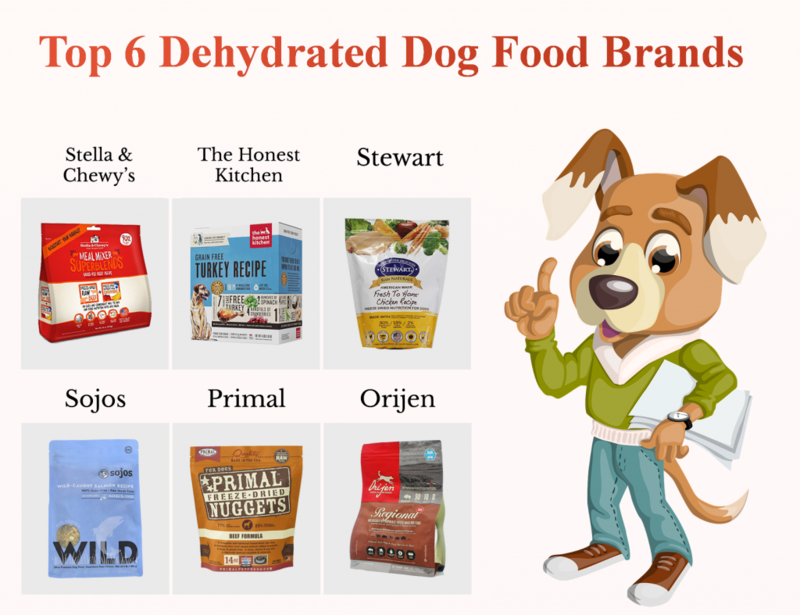 Comparison of the top 6 dehydrated raw dog food brands in 2019. What are the health benefits of the dehydrated diet? Both techniques are far better than drying because there are no cancerous substances that are made drying at high temperature. Ok, now let’s see the top 6 dehydrated dog food brands in 2019. The research has been conducted over the most well-known dehydrated foods and brands in order to find the healthiest and the best dehydrated dog food brand in 2019. Stella & Chewy’s freeze-dried is one of the most popular brand that is made by raw freeze-dried ingreedients. It has a well-balanced composition, great technique of production and it is the healthiest. All these facts make this product the best dehydrated dog food brand in 2019. Wanna see more? With added probiotics for better digestion. With minimal processed raw food. By principle complete & balanced. The company that produces Stella & Chewy’s freeze-dried brands of dog foods is called Stella & Chewy’s, LLC and it is located in America. What makes Stella & Chewy’s freeze-dried brand the best? It is, of course, the composition. The ingredients are very quality, and the composition is well balanced what makes this food great for every dog. So the technique of production is freeze-drying which is most acceptable. Vitamins: B1, B2, B3, B12, B6, D3, E and folic acid, zinc, iron, taurine, calcium carbonate, copper, manganese, sodium selenite, d-calcium. Minerals: potassium chloride, sodium phosphate, choline chloride, zinc, iron, taurine, calcium carbonate, copper, manganese, sodium selenite, d-calcium. As I mentioned in my tips for choosing the best food for you canine friend (you can check it here) the perfect food needs to have good fat to protein (1/2) and fiber to protein ration (1/4). What are ratios for Stella & Chewy’s brand? Fat to protein ratio: 65%. Fiber to protein ratio: 7%. These are almost ideal and one of the best ratios that I found in my research. You will see that many other brands have very high fat to protein ratio and sometimes fiber level are too high or very low which is also not the best option. So I am a dog food judge and I highly recommend Stella & Chewy’s freeze-dried brand because it is the best. It is proven that this diet improves dog’s digestion, reduces the probability of dental problems to a minimum and helps to preserve dog health, skin, coat, and immune system. If you choose it you won’t regret it. The Honest Kitchen human grade brand is very cheap and sill one of the best dehydrated food for a dog. The ingredients that are used for producing these foods are dehydrated on very low temperature which preserves their nutritional value. The company that produces these brands is called The Honest Kitchen and it is located in America. The composition is great because ingredients are well selected and still the diet is made to satisfy dogs nutritional needs. 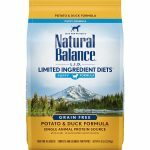 This diet is a lot cheaper than other dehydrated brands and sill contains very quality ingredients and well-balanced composition that provide your pet with many health benefits. Vitamin B1, B12, D3, E.
Minerals: tricalcium phosphate, sodium chloride, potassium chloride, choline chloride, zinc amino acid chelate, iron amino acid chelate, potassium iodide, copper, amino acid chelate, sodium selenite. The composition shows that there are fewer proteins and fats. However, the fat to protein ratio and fiber to protein ratio are well balanced which makes this product very appropriate for your pet diet. Fiber to protein ratio: 24%. With minimal dehydrated ingredients processing, this can be a very delicious and healthy meal for your canine friend. Stewart brand is not so famous but it is very healthy and very appropriate for pets. All ingredients are natural and nutrient rich. The company that produces these brands is called MiracleCorp and it is located in America. The foods are not cheap but as you will see below the ingredients list as well as the fat and fiber to protein ratios are very good. What is the composition of Stewart brands? Omega: Omega-3 3%, Omega-6 6%. Minerals: Potassium Chloride, Sodium Chloride, Zinc Proteinate, Iron Proteinate, Copper Proteinate, Manganese Proteinate. The technique of preserving ingredients is freeze-dried which is the most appropriate for pets. Also, food is well adjusted for all breeds and all life stages. Now let’s see the ratios. What are Stewart fat and fiber to protein ratios? To both fat to protein and fiber to protein, ratios are almost ideal. If you ask me this is one of the best pet food brands and it is definitely worth to try. …than previous solutions and that is why I put Stewart brand in third place. 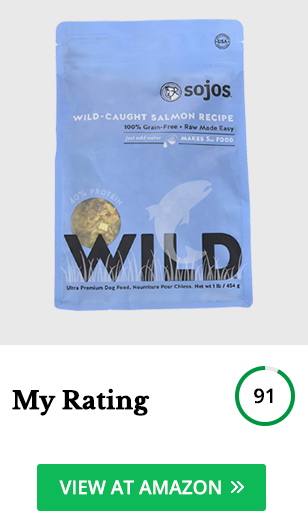 Ok, this was the top 3 dehydrated dog food brands in 2019. In the following part, you will see the best alternatives. Sojos brand is well known by the very wide range of quality products. These companies provide you quality foods for an acceptable price. The company that produces these brands is called Sojourner Farms, LLC and it is located in America. All ingredients are natural, well selected and also freeze-dried so whole nutrition are well preserved and there is no need for dangerous preservatives. 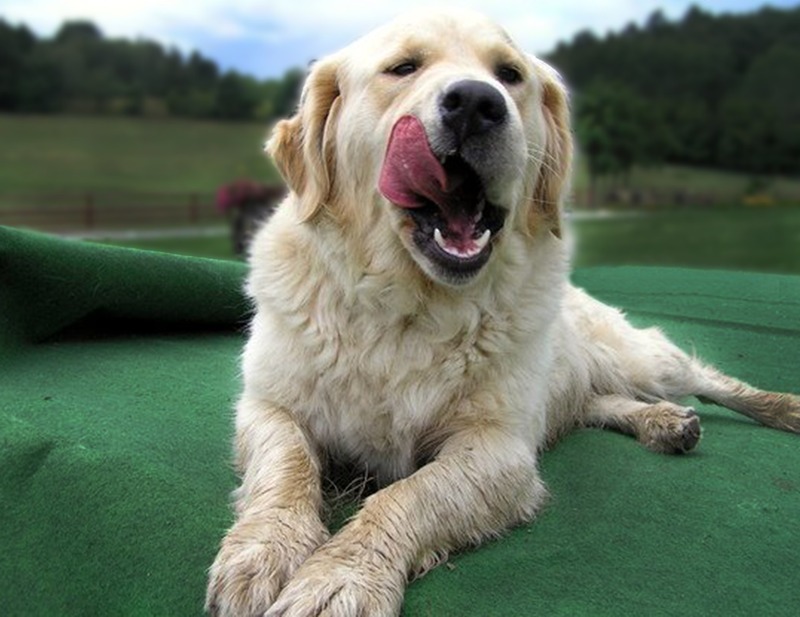 The foods provided by Sojos satisfy AAFCO standards which makes them well appropriate for dogs. However, the best picture can be seen in the composition list. Minerals: tricalcium phosphate, zinc sulfate, ferrous fumarate, copper sulfate. In the ingredient list, I found green peas which are less appropriate for pet foods. However, the amount of peas is very low so you don’t need to worry much with it. Fat to protein ratio: 40%. Fiber to protein ratio: 15%. So the fat to protein ratio is very good. There is a lot of proteins which are actually good for dogs. On the other hand, the fiber to protein ratio is little higher. To long short the story, the Sojos food is a very nice alternative but I would rather suggest the previous brands. The Primal freeze-dried brand is very popular because it is produced as a BARF or biologically appropriate raw food. So this brand contains raw ingredients that are very appropriate for dogs diet. Primal products are produced by the company Primal Pet Foods, Inc. which is located in America. All ingredients are well chosen in order to satisfy AAFCO (Association of American Feed Control Officials) requirements. These brands are adjusted for all dog sizes and ages so you don’t need to worry about that. However, you will need to follow the instructions about quantity which you need to provide to your pet in order to satisfy its nutritional needs. What is the composition of Primal freeze dried brands? The ingredients are well chosen from organic producers which makes them very quality. The technique of preserving ingredients are freeze-dried which is the most appropriated for pets. But what about fat and fiber to protein ratios? Fat to protein ratio: 79%. Fiber to protein ratio: 2%. So the fat to protein ratio is higher which provide these foods with a lot of calories and the fiber to protein ratio is a lover. That is why these foods are less appropriate than previously mentioned brands. However, if you need food that will make your pet strong than primal products are the right for you. Orijen freeze dried brand has become very popular in the world. This brand is as well one of the BARF or biologically appropriate raw food member. Orijen products are produced by the company Champion Petfoods which is located in Canada. All ingredients for foods are chosen from well know producers which produce organic meat and vegetables. So we are talking about a very quality brand. What is the composition of Orijen freeze dried brands? Minerals: calcium 0.6%, phosphorus 0.5%, iron, zinc, manganese. Omega-3: Omega-6 2%, Omega-3 0.4%, DHA 0.07%, EPA 0.07%. In a detail examination, I saw that the products contain peas. Peas are not well accepted for dog foods and I don’t recommend these ingredients. However, the amount of peas is very small so you don’t need to worry much. To be more precise the 90% of proteins are coming from meat ingredients ie. animal-based proteins. This is a very high percentage. How about Orijen fat and fiber to protein ratios? Fat to protein ratio: 97%. So the ratios are not good. The fat to protein ration is extremely high 97% which is far from optimal 50% and the fiber to protein ratio is slightly elevated. That is the main reason why Orijen brand is on these place. 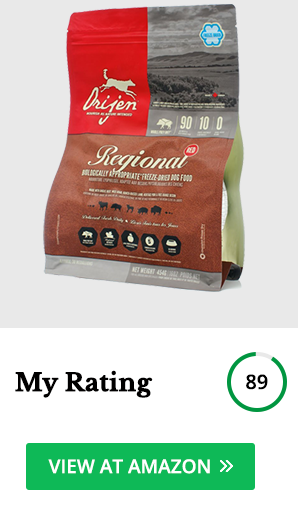 Orijen is very good and quality food and it will be a far better option than dried foods but it is not ideal and as a dog food judge I have to provide it a lower grade. There are advantages and disadvantages in every dehydrated brand I examined. In order to conclude which one is the best, I made a comparison of the top 6 dehydrated raw dog food brands in 2019. …of production. I would like to mention that this is a brand analysis. What does this mean? This means that there are various products. Depending on the product you can see a lot of difference in the ingredient list as well as the quality. Here I compared the best products that I found in my testings. Above I place the links to the Amazon pages where I bought the product. These are the cheapest options I found. To be completely honest with you, if you buy a product by the link above I will receive a buck or two. It won’t make me rich but it will help me to continue my work and examine more dog food brands. Now let’s see the best brand. The best-dehydrated dog food brand is Stella & Chewy’s. Why? The comparison of the categories shows that this brand is better than others. 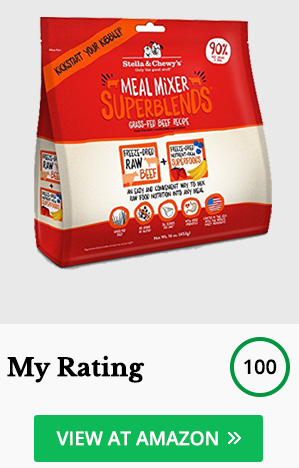 The best brand is rated 100/100 and I highly recommend you to use this food for feeding your pet. 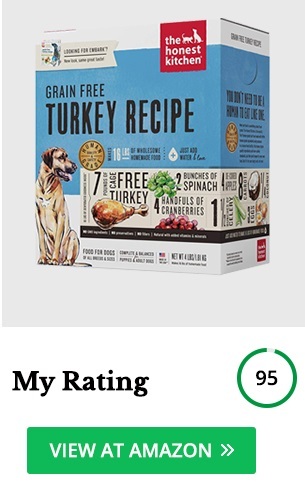 Why does Stella & Chewy’s Dog Food Brand have the highest grade? Contains probiotics for better digestion of the dog. It has almost ideal fat and fiber to protein ratio. Use the best technique of production. It has an ideal composition. It has an acceptable price. So if you are looking for the best then this is the best brand I saw. I use it to feed my pet and I highly recommend you to do the same. This food will help you to preserve your dog health and extend its life. Why other brands get the lowest grade? The Honest Kitchen has two disadvantages. The first one is dehydration process which is less appropriate technique than freeze-drying. The second disadvantage is the level of proteins in the composition which is very low. However, the Honest Kitchen is very cheap but still healthy food for dogs and many people all around the world prefer it. Stewart products are very well balanced and I have an ideal composition. However, the price is very high so if you have big dogs and you want to feed them with these foods then I hope you have very deep pockets. In the Sojos food, I found green peas ingredients. These ingredients are less appropriate for dog diet. However, the ratios are very good but the price is higher. I think that the Sojos is a very good alternative but it isn’t the best. 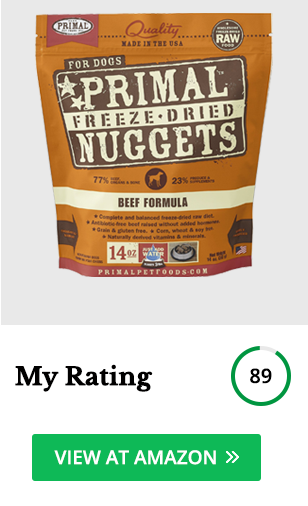 The Primal freeze dried brands are well known by the meat amount which is very high. This brand has a lot of proteins and a lot of fats which makes him high-calorie dog food. I recommend it as a great product for a dog who needs to get weight. However, in most cases, it is not appropriate food. The fat to protein ration is very high ie. 79% and the fiber to protein ration is very low 2%. Also, the price is very high. And that are the reasons why I provide it lover grade. The last brand which I place as the sixth best pet food is Orijen. Orijen price is good but the fat to protein lee is extremely high ie. 97%. That is far from 50% which is ideal. Also, in the composition I found peas ingredient which is less appropriate for dogs. If you are looking for an unhealthy and bad brand then you are in the wrong place, my friend. The dehydration foods that I show you above are the best dog foods that can be found on the market. Each of these brands are highly better than dry dog foods. You will not mistake if you choose any of these brands but still, I am a dog food judge and I am looking for the best. 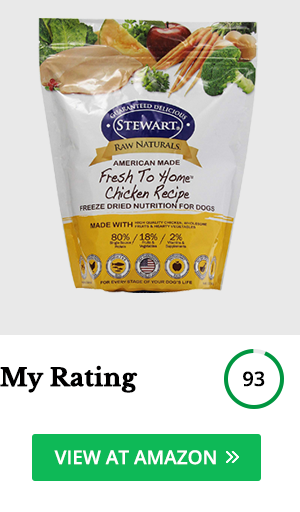 In order to find the best I tested the foods and conclude that the best dehydrated dog food brand in 2019 is Stella & Chewy’s. Dehydrated diet is more expensive than other and that is why brands are focused on providing their customers with the best of the best. There are many health benefits of the dehydrated diet. 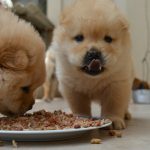 This diet is the most appropriate for dogs because ingredients are containing nutrition like they are raw but still the composition of foods are well balanced which means that your pet will get all nutritions that his diet needs. What are health benefits of feeding dog with dehydrated diet? 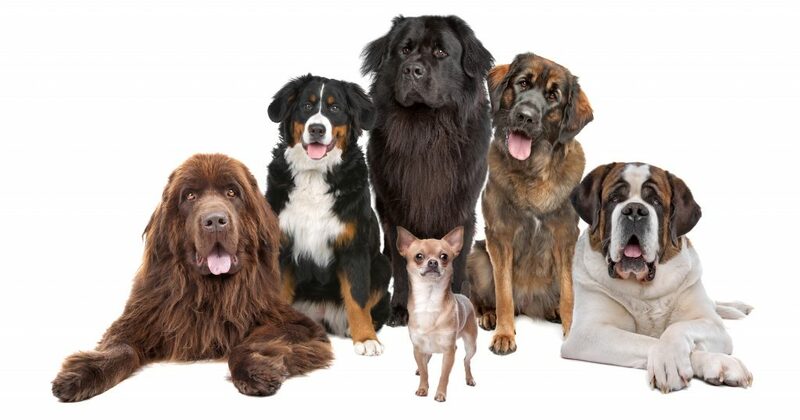 In a long-term, your canine friend will be healthier and its lifespan will be maximum ie. it will live longer. The risk of many fatal diseases like cancer is lower to the minimum with dehydrated diet. So if you want a healthier dog that will live longer, feed him with dehydrated diet. 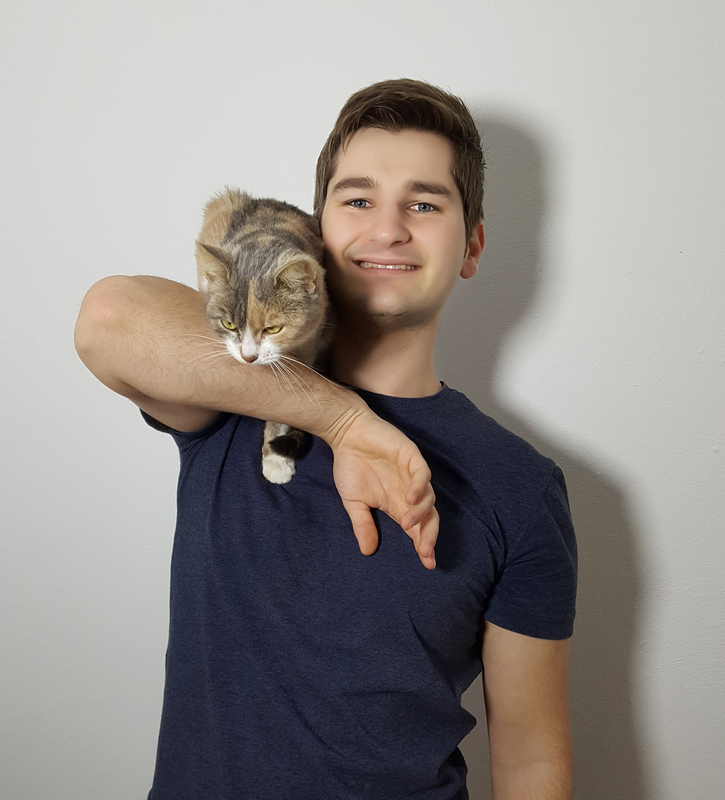 I am a dog food judge Mirko Nuli and I have examined dehydrated foods and point out the top 6 dehydrated dog food brands in 2019. The best brand is Stella & Chewy’s with product beef meal mixer super blends. This food has the highest possible 100/100 grade which is totally deserved because it leads in all categories. However, there are other brands which can be a great alternative. I’m a dog food judge. I specialize in examining dog food nutrition so that I can recommend you food that will preserve your dog’s health and extend his life. Good food will help you prevent dog health problems like obesity, diabetes, pancreatitis, gastroenteritis, nutritional imbalance, and many others. Also, by preventing serious illnesses you won’t have to pay huge veterinarian bill later.